Nearly 100 trillion bacteria, fungi, viruses and other microorganisms compose your gut microbiome, and advancing science has made it quite clear that these organisms play a major role in your health, both mental and physical. Your body is in fact composed of more bacteria and other microorganisms than actual cells, and you have more bacterial DNA than human DNA. In the interview above, originally aired in 2015, Dr. David Perlmutter discusses the importance of gut health, the connections between your gut and brain, and the role your gut plays in your health, and in the development of autoimmune diseases and neurological disorders. Indeed, the connection between your gut and mental health appears to be so strong that some have proposed probiotics may one day take the place of antidepressant drugs. According to an article published in the June 2013 issue of Biological Psychiatry,1 the authors suggest that even severe and chronic mental health problems, including post-traumatic stress disorder, might be eliminated through the use of certain probiotics. Two strains shown to have a calming influence, in part by dampening stress hormones, are Lactobacillus helveticus and Bifdobacterium longum. Others may have similar effects, although more research is needed to identify them. Using MRI scans, Dr. Emeran Mayer, a professor of medicine and psychiatry at the University of California, is also comparing the physical brain structure of thousands of volunteers, looking for connections between brain structure and the types of bacteria found in their guts. 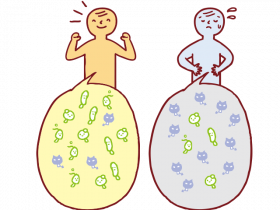 The human gut has 200 million neurons — the equivalent of a cat’s or dog’s brain. And, if an animal is considered intelligent, your gut is equally smart. Your gut also houses nearly 100 trillion microorganisms, which influence everything from biological to emotional functioning. Your vagal nerve is the 10th cranial nerve and the longest nerve in your body, extending through your neck into your abdomen.3 It has the widest distribution of both sensory and motor fibers. Your brain and gut also use the same neurotransmitters for communication, one of which is serotonin — a neurochemical associated with mood control. However, the message sent by serotonin changes based on the context of its environment. In your brain, serotonin signals and produces a state of well-being. In your gut — where 95 percent of your serotonin is produced — it sets the pace for digestive transit and acts as an immune system regulator. Interestingly, gut serotonin not only acts on the digestive tract but is also released into your bloodstream, and acts on your brain, particularly your hypothalamus, which is involved in the regulation of emotions. While we’ve known that the gut and brain communicate via the vagus nerve, researchers have only recently come to realize that gut serotonin regulates emotions in a much more complex way than previously thought. Not only can your emotions influence your gut, but the reverse is also true. Researchers have been able to better examine the gut’s influence on emotions by studying people with irritable bowel syndrome (IBS), which affects 1 in 10 people, and is characterized by digestive difficulties and severe abdominal pain. This, despite the fact that no organic malfunction in the digestive system can be found. Research shows that in patients with IBS, the nerves in the gut are far more active than in healthy people, which has led researchers to speculate that the pain IBS patients suffer is the result of a hypersensitive nervous system. Others have noted that IBS is frequently brought on by stress or emotional trauma. To dampen hypervigilance in the nervous system, some researchers are using hypnosis to help ease IBS patients’ pain. While the brain is still receiving the same kind of pain signals from the gut, hypnosis can make your brain less sensitive to them. So, pain that was previously intolerable is now perceived as tolerable. The effectiveness of hypnosis has been confirmed using brain imaging, showing hypnosis in fact downregulates activation of pain centers in the brain. Similarly, Dr. Zhi-yun Bo, a doctor of traditional Chinese medicine who specializes in abdominal acupuncture,4 has been able to treat a wide variety of health conditions, both physical and mental, from acute pain to chronic illness and depression, by needling certain areas of the belly. Another intriguing idea is that your gut may in fact be the root of, or at the very least a part of, your subconscious mind. Your gut can send signals, to which your brain responds, even though those signals never reach conscious awareness. Your ability to think positive thoughts and feel emotionally uplifted is actually strongly associated with the chemical messages broadcast by your gut. Serotonin released during sleep has also been shown to influence your dreams. The striking similarities between the gut and brain, both structurally and functionally, have also led scientists to consider the possibility that the two organs may share diseases as well. For example, Parkinson’s disease,5 a degenerative neurological disease, may actually originate in the gut. Parkinson’s affects nearly a half-million people in the U.S.6 According to recent research7 published in the journal Neurology, Parkinson’s disease may start in the gut and travel to the brain via the vagus nerve. Using the national registry in Sweden, researchers compared nearly 10,000 people who had a vagotomy against the records of over 375,000 who had not undergone the surgery. Although the researchers did not find a difference in the gross number of people who developed Parkinson’s between the groups, after delving further they discovered something interesting. “These results provide preliminary evidence that Parkinson’s disease may start in the gut. Other evidence for this hypothesis is that people with Parkinson’s disease often have gastrointestinal problems such as constipation that can start decades before they develop the disease. In short, specific chemicals produced by certain gut bacteria worsen the accumulation of proteins in the brain associated with the disease. What’s more, the actual proteins implicated in the disease actually appear to travel from the gut up to and into the brain. Once clumped together in the brain, these proteins, called alpha-synuclein, form fibers that damage the nerves in your brain, resulting in the telltale tremors and movement problems exhibited by Parkinson’s patients. In fact, the researchers believe alpha-synuclein producing gut bacteria not only regulate, but are actually required in order for Parkinson’s symptoms to occur. The link is so intriguing they suggest the best treatment strategy may be to address the gut rather than the brain using specific probiotics rather than drugs. In this study, synthetic alpha-synuclein was injected into the stomach and intestines of mice. “Sixty days after the injections, alpha-synuclein had accumulated in the midbrain, a region packed with nerve cells that make the chemical messenger dopamine. These are the nerve cells that die in people with Parkinson’s, a progressive brain disorder that affects movement. Over time, as these clumps of alpha-synuclein started migrating toward the brain, the animals began exhibiting movement problems resembling those in Parkinson’s patients. Findings such as these suggest that, at least in some patients, the disease may actually originate in the gut, and chronic constipation could be an important early warning sign. The same kinds of lesions found in Parkinson’s patients’ brains have also been found in their guts, leading to the idea that a simple biopsy of your intestinal wall may in fact be a good way to diagnose the disease. In other words, by looking at the intestinal tissue, scientists can get a pretty clear picture of what’s going on inside your brain. These findings are now steering researchers toward looking at the potential role the gut might play in other neurological diseases, such as Alzheimer’s and autism, as well as behavioral disorders. In addition to digesting food and allowing your body to extract energy from foods that would otherwise be indigestible, your gut bacteria also help determine what’s poisonous and what’s healthy, and play a crucial role in your immune system. Your immune system is to a great extent educated based on the information received from your gut bacteria. So, exposure to a wide variety of bacteria helps your immune system stay alert and actually optimizes its function. Bacterial colonization begins at birth, and things like antibiotic use by the mother or child, birth by cesarean section, bottle feeding instead of breastfeeding and excessive hygiene can all impair a child’s immune function by limiting exposure to beneficial bacteria. Researchers have also discovered that humans can be divided into three enterotypes14 — three distinct groupings based on the makeup of our gut microbiomes, and the difference between them lies in our capacity to convert food into energy. All three groups produce vitamins, but to varying degrees. Curiously, these enterotypes do not appear to be related to geographical location, nationality, race, gender or age, and the precise reason for the development of these enterotypes is still unknown. Diet is one possible, and likely probable, factor. In the future, researchers hope to be able to determine how various bacteria influence health and the onset of diseases. Already, scientists have identified bacteria that appear to predispose people to conditions such as obesity, Type 2 diabetes, liver disease and cardiovascular disease. Experimental data also show different gut microbiota can have a determining effect on behavior, for better or worse, and probiotics have been shown to dampen emotional reactivity, reducing the effects of stress.